The Celtic calendar focused on the cyclical change of seasons. The original Celts celebrated four fire festivals, evenly spaced throughout the year, celebrating the transition of the sun throughout the seasons. These include Samhain (Oct 31), Imbolc (Feb 1), Bealtaine (May 1), and Lughnasadh (Aug 1). These festivals are often combined with the solstices and equinoxes which are thought to be non-Celtic in origin, such as from Germanic Paganism or Neolithic sources. These ‘quarter festivals’ include Yule/Midwinter (c. Dec 21), Ostara (c. March 21), Litha/Midsummer (c. June 21), and Mabon (c. Sept 21). Seasonal changes were very important to the agricultural Celts, who depended on the Wheel of the Year to dictate when to plow, sow, harvest, and rest. 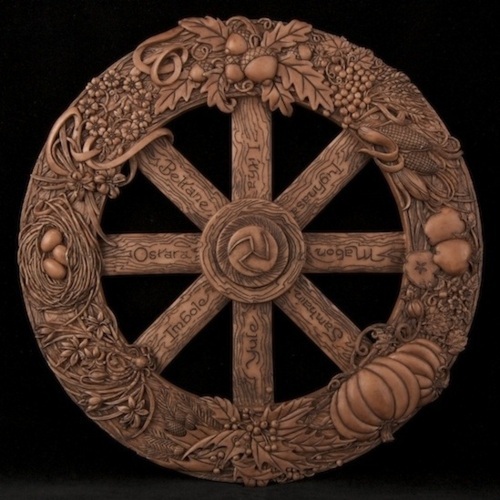 The turning of the Wheel represents the continuing birth, death and rebirth of nature. Note: these dates correspond to the Northern Hemisphere. Samhain (SOW-in) represents the final harvest before the long winter. It’s a time to honor our ancestors and embrace the darker half of the year. This also marks the beginning of the New Year in many Pagan traditions. Yule marks the winter solstice, the shortest day of the year. From now on, the days become longer and we celebrate the return of the sun back to the earth. Also known as Alban Arthan (the Light of Arthur). Imbolc is a festival of fire and light, and in many Pagan traditions celebrates the Celtic hearth goddess, Brigid. It marks the midpoint between winter and spring. This is a festival of purification, a festival of light and fertility, and new beginnings. Ostara is the celebration of the spring equinox, and is a time to prepare for the beginnings of new life each year. The hours of day and night are equal, and light is overtaking darkness. Also known as Alban Eilir (the Light of the Earth). Can I use some of your info like the wheel on my website and in a blog if I reference your site?